Helpful Hints for Proposal Writers: Are you writing appropriate proposal objectives? One of the fundamental points that is relevant to almost all grant proposals is the fact that the proposal is (or at least should be), designed to address a problem or need (that the target funding agency also recognizes as important). Thus, the primary (but certainly not only) purpose of the proposal should then be to explain to the funding agency (and/or the reviewers) what the applicant’s idea(s) would be as to how to address that need or fix the problem. To achieve these goals, a statement of the planned objective (or objectives) for the grant application is usually defined early on. Unfortunately, however, while many applicants are able to identify an appropriate problem or need, the formulation of a specific objective seems to often present major challenges for some people. In essence, (a) grant proposal objective(s) should be relatively simple; namely, formulated so as to solve the problem or address the need. For example, assume that the problem identified by the applicant is that many elementary school children in the U.S. have difficulties in mastering fundamental concepts of mathematics such as addition, subtraction, multiplication and division. Obviously, this would be a significant problem that, if not successfully addressed and fixed, would likely preclude most of these children from ever acquiring these fundamental mathematics skills. This, in turn, would likely limit future opportunities for those children. This is clearly a problem that should be relevant to the Dept. of Education, Institute of Education Sciences, Spencer Foundation, the NSF, and likely many other organizations. With this being the problem, the objective would (or at least should) clearly be to figure out why, and then institute a pedagogical intervention to correct it. So far, so good. Okay, given this situation, what would (should) be the objective(s) that would/should be specifically addressed in the grant proposal? Many applicants may approach this problem by offering the following objectives: 1) Study those successful early mathematics educational programs that appear to be highly successful (e.g., those offered in Sweden, Korea & Canada); 2) Compare those mathematical educational programs with what is currently being done in the U.S.; 3) Develop a new mathematics curriculum based upon identified differences between successful/unsuccessful curricula; and 4) Introduce and evaluate the success of the newly created mathematics curriculum. While all of these are certainly laudable goals and would represent a logical way to proceed, we would respectfully submit that they are not the objectives that the applicant should focus on in the initial presentation of this grant application. In fact, a careful examination of these “objectives” reveals a critical point. Namely, each of these “objectives” defines a specific activity, such as “to study,” “to compare”, “to develop”, and “to introduce and evaluate”. In most circumstances, proposal activities (normally involving a verb) cannot be used to define objectives, primarily because objectives must have a defined endpoint. For example, the objective “to study” clearly defines an activity; namely, what you plan to do, but not why you plan to do it. (Inadvertently, you are only telling the reader how you plan to keep yourself busy if you receive the award.) Questions also then arise as to: “How long would you plan to study this issue?” and “How you would know when you had studied this issue long enough such that you would be able to stop studying it?” (Do you see the problem?) Similar questions could be raised with respect to the other “objectives”. The easiest way to resolve this “problem” is to ask the question: “Why do you want to study the differences?” Clearly, the answer would be something along the lines of: “To identify key elements of successful mathematics education programs.” While the purists might argue that “to identify” also represents an activity, (which is certainly true), that activity (in contrast to “to study”) has a defined endpoint, namely the identification of key factors that serve to distinguish such programs. Similar strategies could be adopted to transform the remaining “activities” into specific objectives, such as “To determine differences between U.S. mathematics education and mathematics education in successful programs”; “Create a successful modified mathematics curriculum based upon key differences” (which would, in essence, combine the third and fourth sets of activities summarized above). In reality, writing true objectives, with a little practice, is not really that difficult! 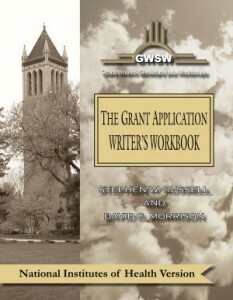 The above discussion represents but one relatively small point regarding the preparation of successful grant applications that is included among the literally thousands of helpful hints that are discussed in equal detail in each of our GWSW series, The Grant Application Writer’s Workbook (NIH, NSF, Any Agency, USDA) as well as our Writing for Biomedical Publication workbook. Thus, if you found the above discussion helpful, you might want to consider a relatively modest investment in the purchase of a GWSW Workbook. More detailed information is included on our Workbooks page. There, we provide links to each of these workbooks, as well as to the Table of Contents and Sample Pages for each Workbook, from several of these important chapters.